Residents of Fishwick Estate in Preston could have been forgiven for thinking they were on a film set the other Sunday. Super heroes and Starwars characters appeared around every corner. 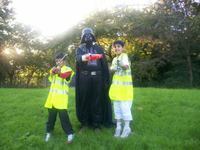 But it wasn't the middle of the latest sci-fi adventure - it was a local group of youngsters doing their bit for MWH Mersey Basin Week by cleaning up the estate. 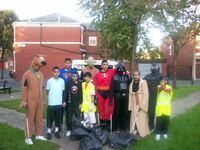 Lead by Zul Hussain, Fishwick Rangers turned out in brilliant fancy-dress costumes to free the streets of litter. With all those super heroes around the litter should be banished for a long time! Well done Fishwick Rangers for showing that improving the environment can be fun. May the Force be with you.